Whenever operation of a machine or any activity in its vicinity poses the risk of injury to workers, safety mechanisms must be put in place. OSHA has prepared detailed guidelines that are very useful in identifying as well as rectifying any errors and loopholes in industrial machinery. We’ll be discussing these factors as well as a solution that can help tackle this problem, for good. The point of operation, from where all the work is performed. Power transmission apparatus, which feeds energy to machines. Moving parts, which are part of the machine or bigger system. There are several mechanical motions that pose risks to workers. These include moving belts, arms, cutting teeth, meshing gear and so on. In addition, actions such as cutting, punching and bending pose significant threat to operators and nearby workers. The major problem of safeguarding these motions is that they usually follow no specific order, so it’s hard to come up with a single strategy for them. Even smooth, slow rotating machines are dangerous. For instance, slowly rotating shafts may grip a worker’s clothing and put him/her in a dangerous position. The danger only increases when projections like bolts, screws and abrasions come into the equation. 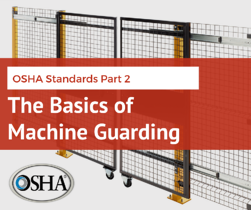 OSHA has set out a few general requirements that a safeguard must meet in order to ensure maximum protection. Prevent contact, keeping the workers’ hands, arms or any other part safe from the moving part. A well-designed safeguarding system makes sure that the moving part is unreachable. Secure, so that workers can’t take off or tamper the safeguarding mechanism otherwise the entire purpose of protection would be defeated. Guards and safety devices must be durable to withstand the harsh industrial environment. Protect from falling objects, making sure that no object falls into the moving part, effectively becoming a projectile and injuring workers. Create no new hazards, otherwise extra efforts would have to be carried out resulting in loss of resources. Allow safe lubrication, so that the machines remain in tip-top conditions and minimum downtime is suffered by the industry. In addition to the mechanical risks posed by moving machinery, there are plenty of non-mechanical hazards as well that may injure workers. Almost all of an industry’s machinery is driven by electrical power, in one way or the other. The equipment therefore poses a shock-risk, which may prove fatal. Therefore, effective grounding should be in place, or the safeguarding must ensure complete isolation during operation. Machines often produce noise, which may become unbearable after a certain amount of time. Noise can not only disrupt concentration, but it can also have harmful effects such as nausea, fatigue and reduced muscle control. It is therefore stated that ear plugs and muffs should be provided for adequate hearing protection. Many machines require frequent maintenance operations such as cutting fluids, coolants, etc. Exposure to these chemicals may cause diseases & illnesses. Therefore, specially constructed safeguards, ventilation systems and protective clothing should be offered to workers. The guarding is available in either 6ft. or 8ft. panels, whereas other dimensions may be ordered as well. The panels can be stacked, one over the other, which allows safeguarding machines irrespective of their size. Each panel has connectors that bind the vertical framing members strongly. However, if needed, these connectors can be removed easily for modifications. In addition, the wire mesh is capable of withstanding almost all kinds of tampering, whereas the line posts are universally pinched to make them compatible with all types of panels and doors. Most importantly, Husky’s guarding hardware strictly follows OSHA’s rules and regulations, making it an ideal choice for heavy-duty sites. Interested in learning more about modular guarding systems?